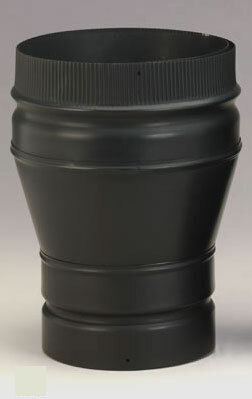 Increases diameter of DSP Stovepipe from 6" to 8"
If you have a stovepipe and need to increase the diameter in order to connect it to stoves and chimneys, Selkirk DSP's double-wall black 6-inch to 8-inch stovepipe diameter increaser is probably what you will need. This allows the diameter to increase from 6 inches to 8 inches. Its black finish is resistant to scratches and will get the job done. The inner liner is made of stainless steel and the outer liner is made of 26-gauge steel. This diameter increaser is intended to be used with wood burning stoves. Will a double wall 6 in to 8 in increaser attach to the stove flue? Yes, this is meant for the 6" bottom end to connect to the flue collar of your stove. Just what I needed as described and works perfect!